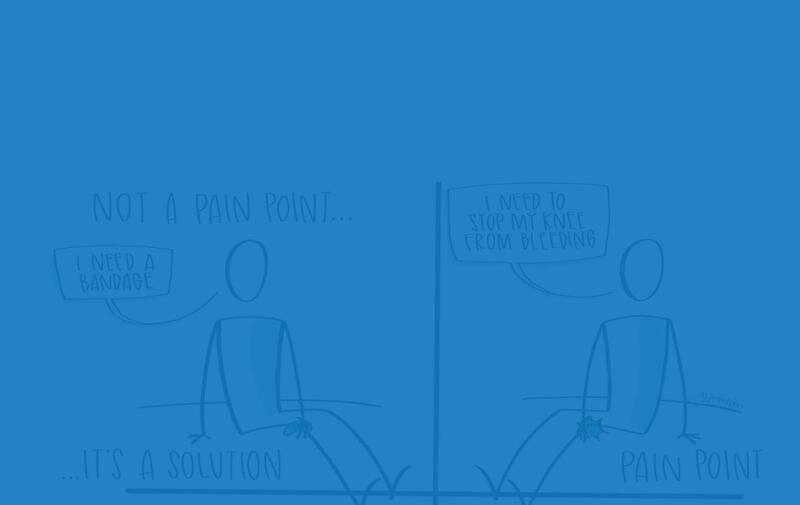 A key component to marketing, and business in general, is understanding customer pain points and then delivering solutions to those pain points. However, a majority of marketers do not understand what pain points truly are, and instead think that solutions are actually the pain points. A pain point is the root problem a prospect or customer has. Businesses exist to solve their customers’ pain points. However, a large number of businesses, and marketers, do not actually understand their audiences true pain points. Instead, they think solutions are actually pain points. 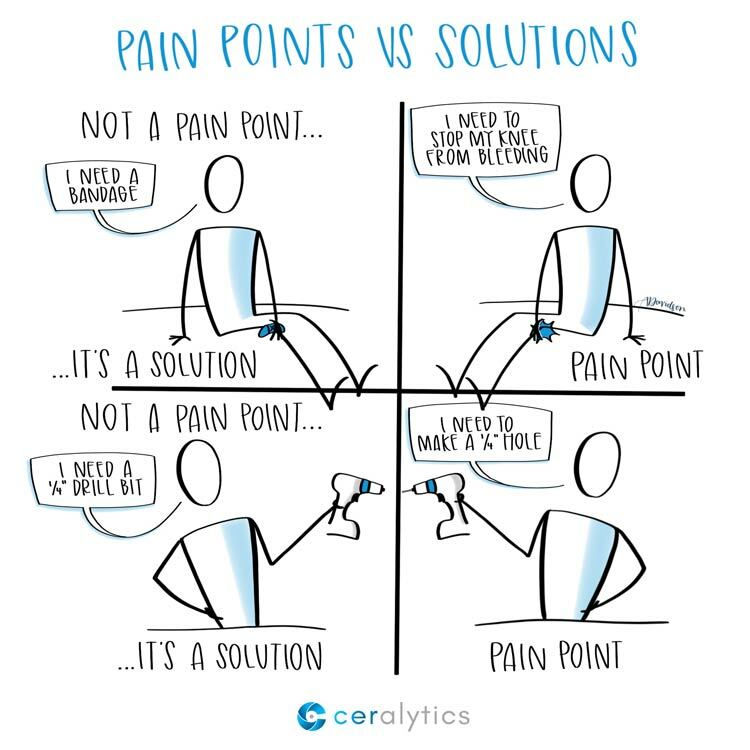 How are pain points and solutions confused? In the sketch above, a marketer will hear someone saying that they need a bandage. So the marketer will present them with a bandage. A great bandage. A bandage that stays on well, but doesn’t hurt when it’s peeled off. A bandage that keeps out infection. A bandage with Olaf from Frozen on it giving the wound a nice warm hug. But the bandage was just the solution, not the pain point. The actual pain point is that the person wants to stop their leg from bleeding. Understanding that as the pain point, the marketing of the solution becomes very different. The solution could still be a bandage, but it would be one that tightly pulls together the wound to stop the bleeding. It would be a bandage that sticks to skin even if the skin is wet with sweat. The new solution could also be medical glue that will stop the bleeding immediately. The key is that the solution should address the customer’s true pain point. The marketing shouldn’t be about the product, it should be about the alleviation of the pain point. And bear in mind that the solution may not be the thing the customer asked for. The myth of Henry Ford saying, “If I had asked people what they wanted, they would have said faster horses,” still holds a very important lesson in it. It’s not a quote about ignoring customer feedback, it’s about getting to the root pain point customers have. In this quote, the pain point has nothing to do with horses or cars. The pain point is that people want to get from one place to another quickly and efficiently. But people see the only solution to that being faster horses. If you understand the underlying pain points your customers have, your approach to innovation completely changes. The way you speak to your audience changes. You don’t hype a solution, but rather call out how the solution alleviates the pain point. You build trust with them. Customers experience pain in many ways, but often times they don’t know how to tell you what that pain truly is. So they ask for a solution. One way to get at customer pain points is to ask open-ended questions and follow up. In the classic example from Theodore Levitt in the sketch above, if someone walks into a hardware store looking for a 1/4″ drill bit, their pain point isn’t that they need a 1/4″ bit. Their pain point is that they need a 1/4″ hole. Don’t ask them what kind of features they want in a drill bit. Ask them what they want the drill bit for. As the expert, you’ll then know what to prescribe to them. A quantitative, data-driven way to identify pain points is to look at data on your website and the websites of competitors. What types of content and topics do they gravitate toward? Do they consistently show interest in certain topics over others? Dive into why that may be. Pain points can be measured en masse this way, identifying many of the main pain points your audience has. 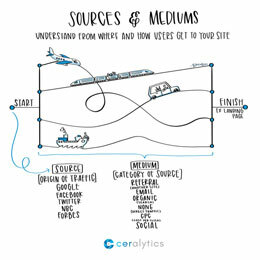 Content intelligence tools like Ceralytics provide an easy and effective way to uncover these pain points. Another way to identify pain points is to talk to your sales team and see what pain points they see. If they reference a solution as a pain point, ask them why the customer needs that solution. Keep up this process until you get to the root cause of the customer’s pain. Look at your own marketing. Are you promoting solutions and features, or are you addressing your audience’s true pain points? Start with one of your current solutions or products and try to identify the true pain point of your audience that the solution addresses. Then look at your content. You’re now in your customer’s shoes. Does the content you have truly address the pain point in a way that builds trust and understanding of their problem? If not, it’s time to rethink your approach.